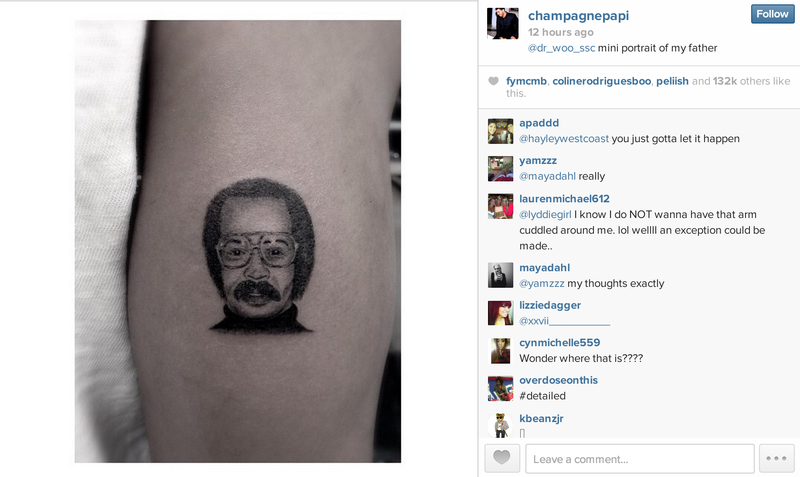 Drake revealed a photograph of his latest tattoo in an Instagram post made yesterday (January 30). The tattoo, a portrait of his father, Dennis Graham, was done by Dr. Woo of Hollywood, California’s Shamrock Social Club. “My dad is a star,” Drake said last year. “That’s what you have to understand. I can call my dad right now and be like, ‘Yo, dad, I need you to fly to shoot.’ He’s always down. I’m living my dad’s dream. My dad wanted to be a famous singer. I have my dad on another bonus record on the album called ‘Heat Of The Moment.’ It’s a real relationship. Not to be ironic, we go through the motions of a father-son relationship. Right now, he happens to be extremely stable and content, and I take care of what I can for him. All he wants to do is go to Beale Street in Memphis and play music. He’s rediscovered his passion for music and for being a musician. A photograph of the tattoo can be seen below.